China Pipe Coupling Manufacturer www.steeljrv.com supplies Pipe Couplings, Tube Couplings, Coupling Pipe Fittings in all kinds of materials, such as carbon steel, stainless steel, alloy steel, etc. China Half Coupling Manufacturer www.steeljrv.com offers ASME B16.11 ASTM A182 F304 Socket Weld Half Coupling，1″，3000LB. China SW Full Coupling Manufacturer www.steeljrv.com offers ASME B16.11 Alloy 20 High Pressure SW Full Coupling. China Reducing Coupling Manufacturer www.steeljrv.com offers ASTM A182 F53 NPT Reducing Coupling, 3/4 Inch X 3/8 Inch, CL3000. China Half Coupling Manufacturer www.steeljrv.com offers ASME B16.11 ASTM A182 316L Socket Weld Half Coupling, DN32, CL3000. China Full Coupling Manufacturer www.steeljrv.com offers ASME B16.11 ASTM A182 316L NPT Full Coupling, DN20, 6000PSI. 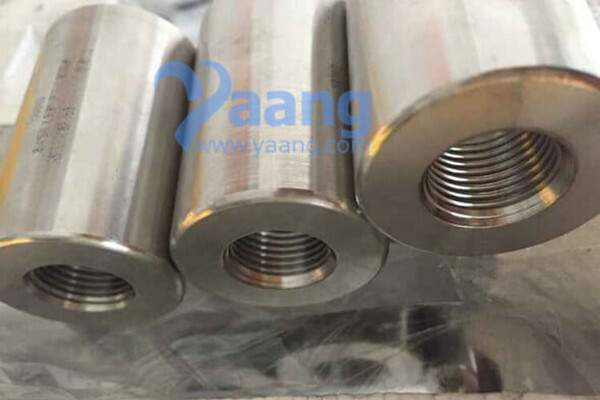 China Coupling Manufacturer www.steeljrv.com offers ASTM A182 F53 Threaded NPT Reducing Coupling, 3/4 Inch X 3/8 Inch, CL3000. China Pipe Coupling Manufacturer www.steeljrv.com offers ASTM A105 Thread Pipe Coupling, DN20 X DN15, 3000LBS. China Pipe Coupling Manufacturer www.steeljrv.com offers ASME B16.11 ASTM A182 F304L Socket Weld Coupling, DN40, 3000LBS.